We have made it our new Saturday morning habit to leave home just after sunrise, buy a delicious coffee from Zarraffas, and scan the newspaper for local (and occasionally not so local) garage sales. This is such fun and a pastime we missed during 2015-16 when Mr E was working six days a week, so getting back into our old weekend routine has kind of felt a bit like 'coming home'. Some weeks we find wonderful bargains and other weeks perhaps just a book or two - as was the case this past Saturday. $1 each and they're both really good, especially A Slice of Organic Life which I am reading cover to cover because it's full of excellent ideas for living more sustainably. In fact I keep a sheet of paper inside to write notes about simple things I can do in the coming month, like sewing some basic but sturdy grocery bags and planting salad greens in pots on the back deck. "The fact is we just have too much stuff, and today we simply discard anything that we consider no longer fit for purpose. This is the moment to change our general philosophy - to think about the pleasures of recycling and rejuvenating, and to look around at all we own, from cushions to cabinets, and think about what we recycle, rejuvenate or learn to re-like..."
"There is something about the sight of a jigsaw on a table that is so inviting - few can walk past without the temptation to look and see if they can find the key piece that everyone else has missed - and the very fact that it is there speaks volumes about the sort of companionable house they find themselves in." "If you have asked a guest to eat with you, bring them to a table laid with care - that in itself shows concern for a guest's welfare and wellbeing." Can you see why I'm enjoying this book so much? It's filled with commonsense and homely nuggets of wisdom. 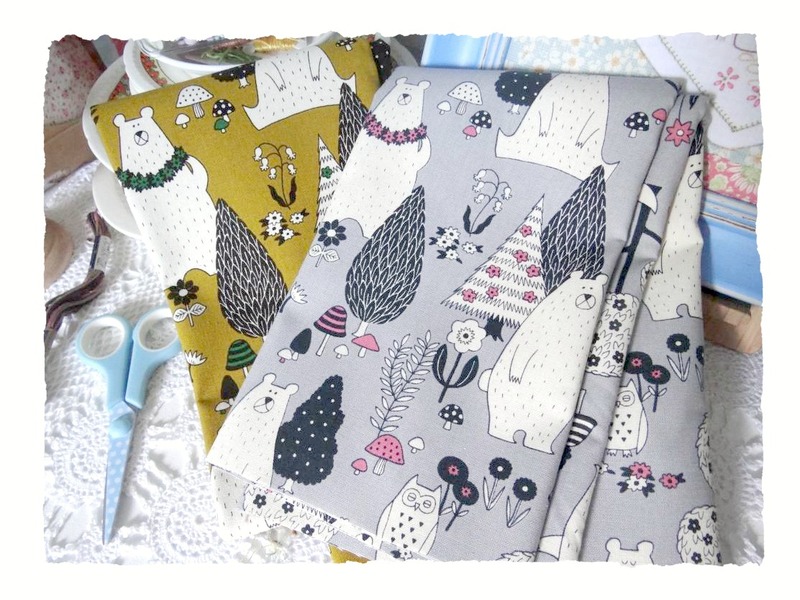 Two of my young grandchildren have birthdays soon and this week I'll be making both of them a special pillow. Frankie Juliette will be 3 and Austin will turn 1. Aisha is a wonderful and gentle mother and quite often texts me candid photos of her two little cherubs at play throughout the day or during the night when one or the other, and sometimes both, are restless or under the weather. They snuggle together downstairs in the living room with pillows and blankets so daddy Tim can rest (he works two jobs) and watch a soothing movie until all have settled again and fallen asleep. 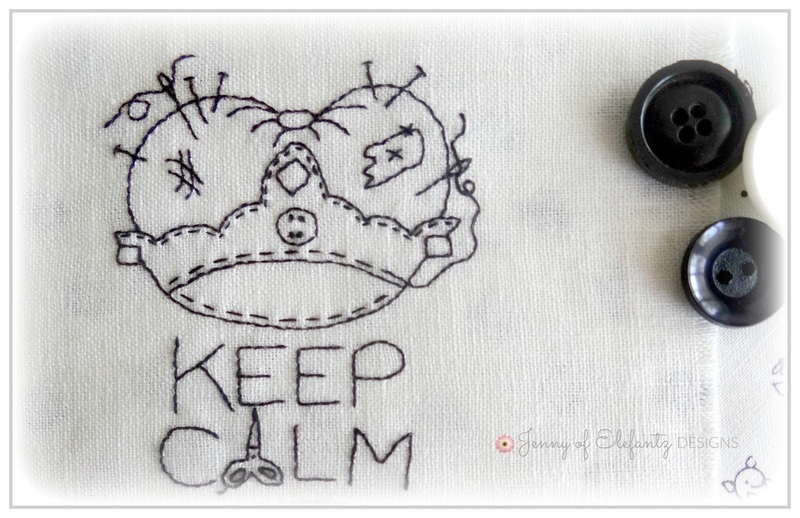 ...and will make pillowcases for the children using Ali's name applique tutorial to personalise each one. Perhaps a pocket at the side with a soft cuddly toy might be nice too? Now these aren't fabrics as such, but a set of three handkerchiefs I bought at K-Mart for $4. 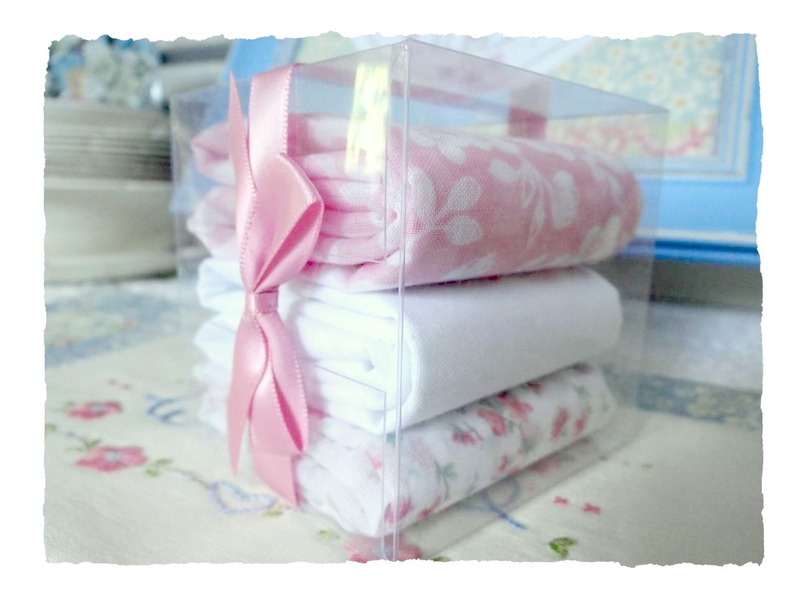 My idea is to use them in a small project for our bedroom, the plain white hanky being perfect as a stitchery background and the two floral prints as perhaps a patchwork border? ...but it's a lot of fun stitching for Christmas in April except that a festive feeling spreads through my day and I crave fruit mince pies all the time. LOL! You may have noticed, or you may not have noticed, that I have a button in my blog sidebar this year featuring a "Pattern of the Month" and around the 1st of each month the pattern changes. April's $2 pattern is one of Blossom's favourites, one I think she'd like to see displayed in her home but as it's also one of my favourites too it is staying put right here. The pattern comes in two sizes and is very simple. ...in mostly backstitch with a tiny bit of running stitch, a few crosses and four french knots. 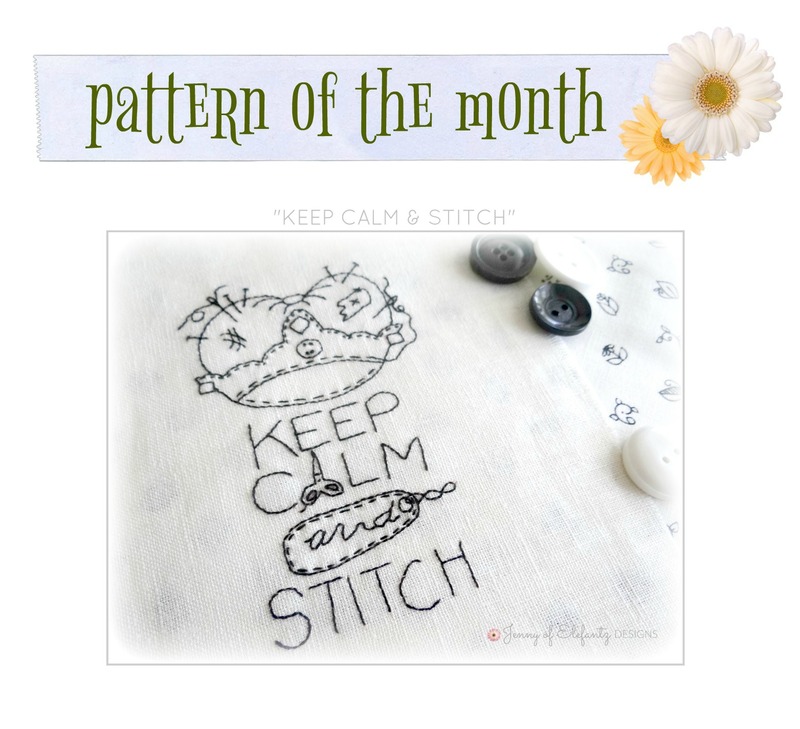 This $2 pattern of the month is here in my shop as an instant download. Perhaps I should stitch it again for Blossom...mmm? 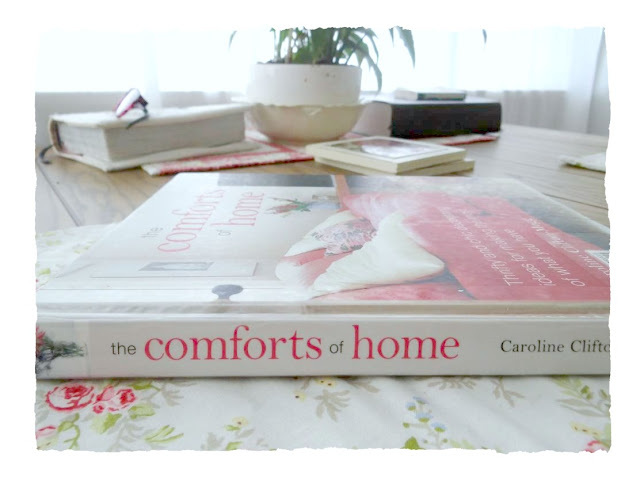 What's your current 'home inspired' read? I'd love to know! Goodness, I can't believe your grandies are that old already! I really love those 2 fabrics from Spotlight. Just perfect. Fantastic idea buying that hanky pack . You come up with some very clever ideas. 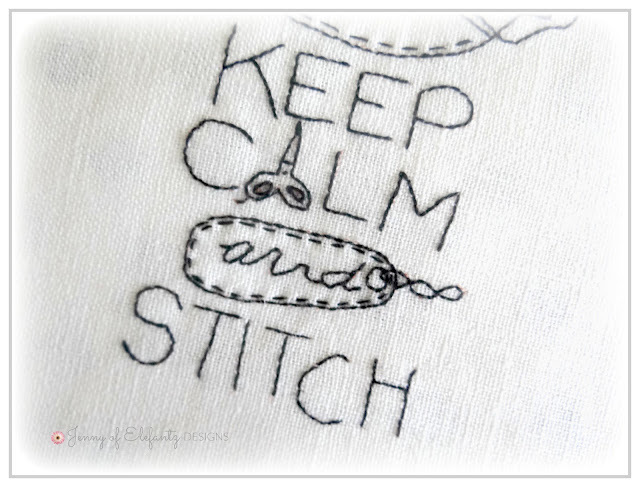 Your secret stitching looks very interesting . 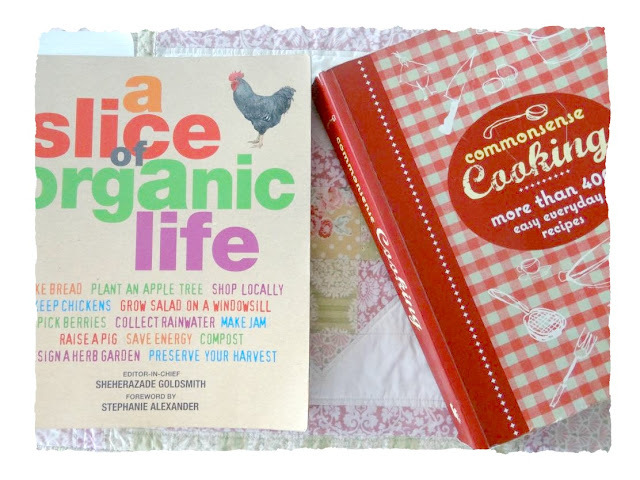 I don't really have any books on home but I did do a permaculture course many years ago as I was quite into sustainable living and organic living. We grow lettuce, zucchinis , capsicums, tomatoes etc in pots and half wine barrels. We used to have no dig vegie garden but as Mark is the vegie grower that style became harder for him in a wheelchair so that is why we now grow everything in pots. So lovely to know you feel so inspired. I hope your migraines stay away. Angel hugs. 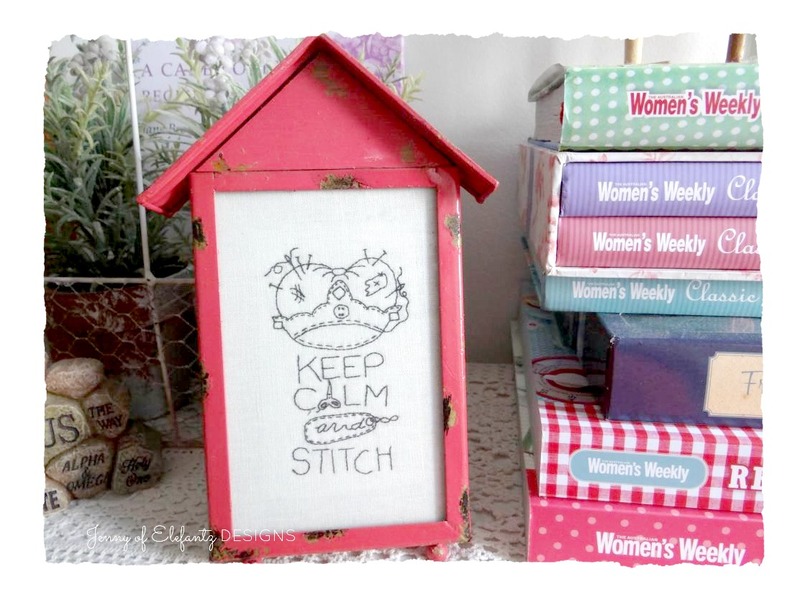 Dear friend, when I look for inspiration for my home, I read your blog. Have a good day. Hugs. 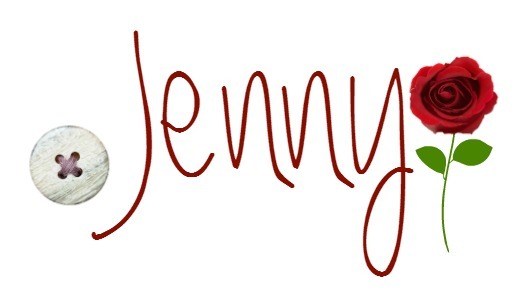 Hello Jenny! Both of the books you mentioned sound delightful and the bits you shared were very good things to remember. I fell in love with the fabric you purchased and think making pillowcases for your Grandchildren is a marvelous idea. I am working on quite a few different projects right now, one of them is stitching a Christmas fabric panel onto batting with straight stitches. 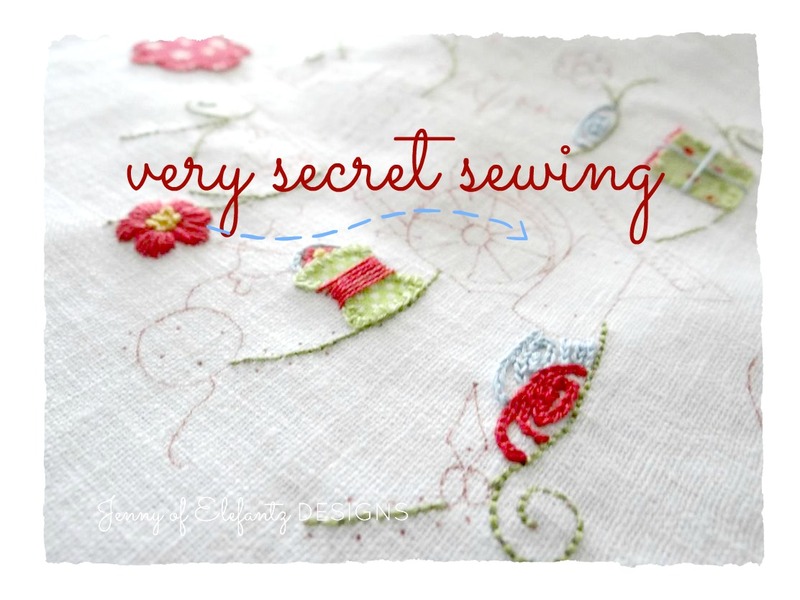 It is such a relaxing project that I pick it up far more often than any other of my stitching projects that I do every evening while watching a movie. 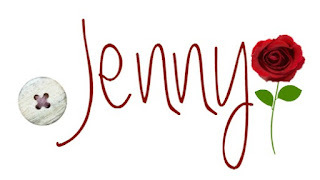 Thank you for all that you share Jenny, your posts are always rewarding. I want to inform you that I am having a lot of trouble with my computer, so when I do not post it is because I can not get on. We do not have the finances to get it looked at, the Lord will provide that when it is necessary far to many other items that are much more important. Have a great time with Mr.E on your Garage Sale weekends, Hubby and I do those also. Have a great day. Shame on me. I don't do home-inspired reading. I always enjoy what you post about it, though. The pillows will be adorable with their names. Not at all what I was picturing! I'm so glad you are getting your Saturday routine back! I can't think of many things more fun than browsing books!